The first VAI release featuring this brilliant young Russian pianist won rave reviews from the world’s press. The headline in the Gramophone Magazine review cautioned, “Fasten your seatbelts” but went on to praise his Haydn as well as the more pyrotechnical aspects of his wide-ranging program. 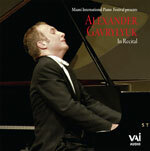 For his second release, also captured live at the Miami International Piano Festival, Gavrylyuk offers elegant Mozart and lyrical Schubert along with thunderous Rachmaninoff and Balakirev, and ending with a group of encores highlighting the pianist’s amazing technical arsenal.